Dave Bass was a basketball and football star at James Monroe High School in the Bronx, New York City. Bass briefly was a member of the basketball teams at St.John’s University in Brooklyn and City College of New York, before been barred from both schools because he was simultaneously playing professional basketball. In and around New York City. Bass was not particularly unique in his pursuit of earning money on the side playing professional basketball while playing for a college team, he was just unfortunate to be caught. Bass continued to play pro basketball throughout the 1930’s, mainly in a backup role. He was in demand more for his hustle and toughness than his skills. 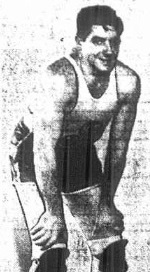 Late in the 1937-1938 season, while serving as a reserve on the Kingston team in the American Basketball League, Bass was chosen to replace Hall of Famer Pop Morganweck as coach of the team when Morganweck became ill.